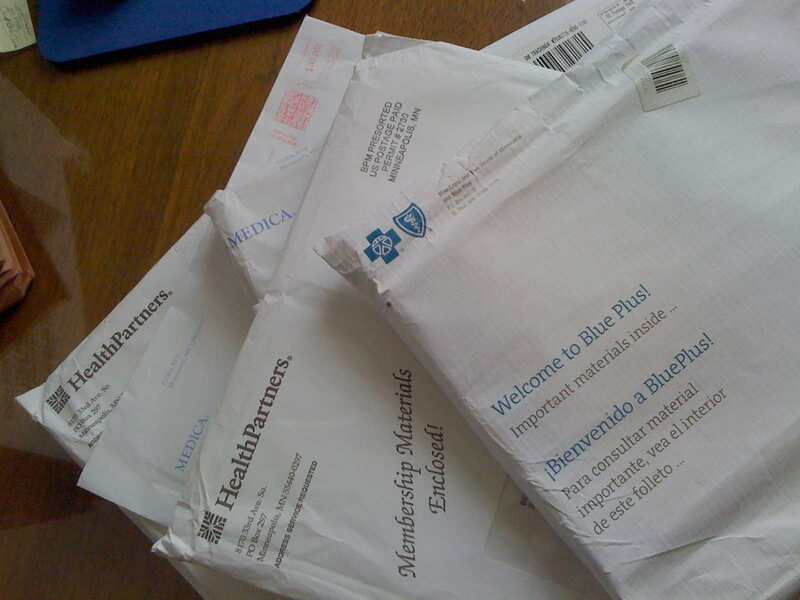 Every month, the post office delivers dozens of half-inch-thick new member enrollment packets from Blue Cross, Medica, Health Partners and other HMOs to 2211 Clinton Ave South in Minneapolis. Most of the packets will be returned to the HMOs, "addressee unknown." No one actually lives there. It's St. Stephen's emergency homeless shelter, and the HMO enrollee packets are for people who qualify for Medical Assistance (see photo here). Why are these costly HMO membership packets mailed to a homeless shelter? Because Minnesota contracts out the Medical Assistance program to several HMOs who are supposed to "manage" their care. The HMOs send the information packets to St. Stephens and other homeless shelters across the state when the new enrollee is homeless. The fact that hundreds of enrollment packets are mailed to people who have no mailing address shows how ineffectively the state and the HMOs are "managing" this population's health care. Even if an addressee is staying at the shelter at the time and actually receives the mailing, what good does it do? The intended recipients certainly need health care; many of them suffer from mental illness or chemical dependency. Many have numerous chronic conditions including diabetes. A disproportionate number are veterans from Vietnam or more recent wars. Are these people, who face many challenges in addition to housing, going to read any of it? And where will they store it? Homeless people don't have file cabinets. These at-risk people don't need enrollment packets, they need someone to help them obtain basic care. As Monica Nilsson, director of street outreach at St. Stephen's puts it, "It's not effective to ask people who don't have a phone or a day planner, a bus card or a watch, to make an appointment, remember the date, get to a certain clinic and be there on time. Many just go to the hospital; they know what time the emergency room is open." Clearly Minnesota's current system is not geared to meet the needs of many of the low-income people it is attempting to serve through the Medical Assistance program. It is time to change this. There is growing bipartisan concern about the lack of accountability in these state contracts with HMOs. To save money and deliver better health care, it is time to end these contracts. Cut out the insurance company middleman – have the state contract directly with medical providers. In addition to demanding better management of this money, we need to actually start providing care for these people – they desperately need it and the state is paying for it, whether they get it or not. If we stop wasteful practices like mailing insurance packets to homeless people and start delivering basic health care instead, we could prevent many of the costly hospitalizations, as well as many costly encounters with human service agencies and law enforcement. This is a big deal. One night in a hospital can cost almost $3000. A night in detox costs almost $200. A night in the Hennepin County Jail costs close to $400. In other words, providing basic health care to sick people when they need help can save money. I have introduced legislation (Senate File 1054) that would end those contracts and have the state pay for medical care directly. In addition to savings from reduced administrative costs, it saves money by delivering care more efficiently. The bill provides payment incentives for health care and social service providers to coordinate the care of Medical Assistance patients, particularly those with chronic or complex conditions, many of whom have not been receiving the treatment they need to stay out of the emergency room. Medical Assistance patients would select a primary care provider who would coordinate their care, like a "health care home". For high risk patients like the homeless, this may involve an outreach worker being paid by a community clinic to go out on the streets or in the shelters, find people who are struggling with mental health or other medical problems, and get them the care they need. As always there are powerful pressures to maintain the status quo. It's good news that the Dayton Administration is looking to tighten up the contracts with the HMOs, but it is not clear that the state can get enough information from the plans to sign good contracts with them. Even if we negotiate fairer contracts, that doesn't improve the situation for the medically vulnerable people who are not getting the basic care they need. Providing care when people need it is a moral issue, and an economic one. For the sake of taxpayers, it's time we recognize that getting someone to the doctor or into a treatment program is much better – and far cheaper – than ignoring them until they are delivered by ambulance to the hospital.